An essential cookie during the holidays, these Gingerbread Cookies are crispy around the edges and soft and delicious in the middle. They’re perfect for the holiday season. 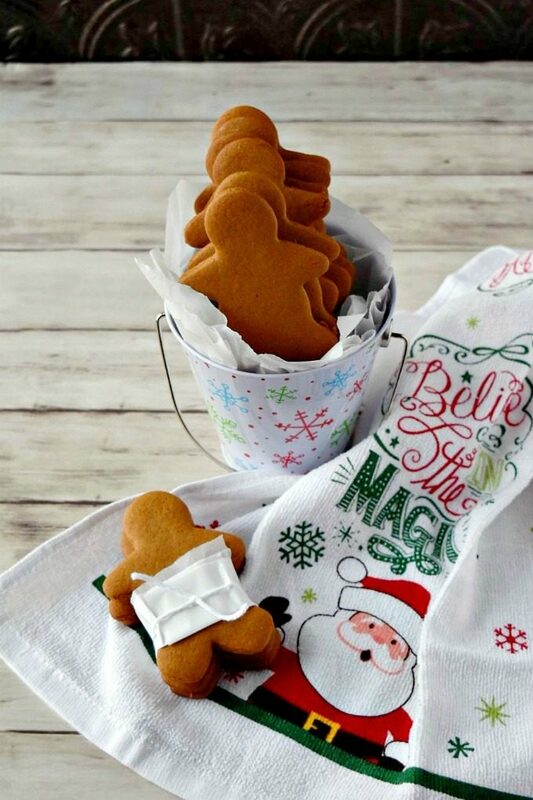 Can you believe that #ChristmasCookies week is over? I can’t either. It’s also hard to believe that I survived the week. When the event started, I only had two cookies made. The others I made as the week progressed. Which is sad. Because I’ve known about this event for a while now. I need to learn how to plan better. Talking about planning, you should plan to enter the giveaway! Nielsen-Massey is offering up a package of extracts to a lucky winner! Hopefully, it’s you! So, head over to my shortbread cookies and enter the giveaway. They’re extracts are da bomb and I love working with them. I had some macaron planned for this week. I just didn’t get around to sharing them. Hopefully, I will be able to get them finished this weekend and share them sometime soon. They’re so pretty and festive! I was playing with a new ingredient, too. Maybe you’ll see what I’m talking about in the photos. If I ever get them photographed. Of course, it’s only fitting for me that we end with gingerbread cookies. Out of all the holiday cookies, gingerbread, soft of crunchy doesn’t matter, are my favorite holiday cookies. Now, I should probably disclaimer that. Out of all the holiday cookies that aren’t family recipes, gingerbread is my favorite. Last year for #ChristmasCookies I shared one of my favorite family cookie recipes that’s been passed down, I think, for generations. The Norwegian Pecan Cookies are like a shortbread cookie, but so much better. It’s laced with maple-y sweet pecans. They’re perfect for the holidays. Those are probably my favorite family holiday cookie. No, they are. Now, the reason I don’t bake gingerbread cookies all that often is because I’d eat them all. Literally. Every.last.one. That ginger aroma and flavor get to me. It’s like kryptonite and I can’t help myself. I eat them like some people eat potato chips. Sad. I know. But it’s true. And I’m all about full disclosure. I thought I would share a PSA with you. You know, public service announcement? Did you know that molasses can go bad? Beware. This post is pretty darned old for me. It’s about 4 years old. But, yes, molasses can go bad. I had no idea. Just warning ya. So, before you bake this recipe, make sure to check your molasses. Okay, so earlier in the week I promised you a little story. A story that I was reminded of when I attended the hubs’ grandmother’s funeral. I’m going to confess that every time I think of the story it brings a tear to my eye. My paternal mother, from my recollection, wasn’t one to show affection all that well. I was convinced my entire life that she just didn’t like me. This is the opinion I formed even later in life when I was old enough to know better. It wasn’t until the day of her funeral where this complete stranger I never met and didn’t know said to me, “Oh! You’re the photographer!” Yeah. I lost it. I didn’t think she even talked to people about me at all. Fast forward a few days and we’re going through the house trying to divide out belongings, family heirlooms, and junk. Yes. It some of it was junk. She was the youngest of 13 and grew up during the depression. You kept everything that was useful not knowing how you’d use it, but you knew it was useful. There were some ice tongs I wanted because I loved kitchen gadgets and that was one that just looked cool. And the cookie cutters. And it was at that moment that I had to step out of the kitchen and simple broke down. Why cookie cutters? Of all the things that had happened why was it the cookie cutters that cause this? I remember helping her make sugar cookies one year. We cut them out with those cookie cutters. It might have been on or two times, but enough to make an impression. So, I use these cookies cutters lovingly and don’t take them out all the time. They are special to me. So, I hope you can see how special these cookies are. These cookies are perfectly crispy around the edges and nice and chewy in the middle. They’re like a mix between snap and a soft gingerbread cookie. They have just enough molasses and ginger flavor that it’s not overpowering. If you want, you can add more ginger. Mine was freshly ground so it’s a little more potent then regular ginger in the store. And that concludes #ChristmasCookies week! I hope y’all enjoyed all the recipes we shared and will be getting your kitchen doing a little hooring of your own. Combine the flour with the next six ingredients. Stir lightly with a whisk and set aside. In the bowl of a stand mixer fitted with the whisk (or a large bowl with a handheld mixer) cream the butter and sugars until light and creamy. Switch to the paddle and stir in the egg and the molasses. Carefully add the flour a little at a time until the dough is no longer sticky. Refrigerate for an hour or more. Working in small batches, place the dough on a lightly floured work surface. Roll out to 3/8” thickness and cut with your favorite cookie cutters. Bake at 350 to 9 to 11 minutes or until lightly golden around the edges. Cool in the pan 5 minutes then remove to a wire rack to cool. Store in an airtight container for up to 2 weeks. I love a good gingerbread cookie! Can you believe I’ve never made gingerbread men? Love these photos! The cookies are so cute. And they held their shape so well! What? Why not? They’re one of my faves and fun to make with kids. I used to decorate them, but not so much any more.